Today was the worst. Add up unrealistic expectations, a messy house, unfinished projects, coat sleeves turned inside-out, tired kids and an even more tired mom, and we got a group of crying, screaming half-dressed small people in the garage by 11am. The worst part was, I knew it was all my fault. I had over used my tv-as-distraction tool to get some things done. It was time to head to the gym as we always do. However, I had a project 97% finished and wanted that extra 15 minutes before we HAD to leave to finish it. For me to get that 15 minutes, the kids were going to have to get their own shoes on. I know they hear it too much because I hear Evi repeating it often to her brother… with the same aggravation grating her voice that I hear in mine. So as I bent to hook a carseat buckle, I stopped short and just said, “you are driving!” As if a preschooler behind the wheel is going to steer this chaotic mess back to sanity-station. No, the kids should not be in the driver seat. And neither should I, in fact. “God, would you take over here! ?” I prayed. “Build a fort, mama.” He whispered back. My heart found hope in that simple prerogative. I abandoned the mission to get out of the house, embracing the stay-in-the-moment resolve instead. I scooped the kids out of the car, gathered blankets, unrolled a few strands of Christmas lights, and hijacked our living room to stage our fort. I found a treasure chest in storage and filled it with up with books. The children were so excited about their new treasures. We cuddled in the close quarters of our blanket fort and breathed in the rhythmic words of children’s stories. Tears turned to tickles. Sobs surrendered to warm snuggles. Frustration stepped aside when fun came in the room. There in our fort, we all found shelter. The lights twinkled under the blankets, and their eyes twinkled under the covering of my affection. And my own heart rejoiced for the undeserved banner of love I receive from my own good, good Father. In that moment, I realized He makes a blanket fort of grace over me every day. The tears I have now are drops of awe and gratitude. Perhaps tomorrow I will prioritize a moment of intimacy with my kids earlier in the day. And in doing so, we might end up leaving the house a satisfied and whole group of people on our way to accomplishing something lovely or productive for the day. That was not how this day began, but I continue to embrace the art of stay-present mothering. In fact, I think our living room full of floating blankets was the kind of lovely and productive we needed. On the worst days, dear mama, let’s build a blanket forts for our kids, and snuggle them close under the blanket of grace God has built over us. “Let’s mosey,” my husband said. I tried to decipher whether it was a pleading question or a gentle statement. It took us about 2 years of marriage to discover the importance of communicating expectations for family activities… especially during the holidays. Now after 8 years, this is still imperative for our relationship. I think I inherited her crown about the time my twins started walking. I see every vacation as a buffet of opportunities. Things to do, people to see, restaurants to taste, places to explore. I am an adventurer, after all. When we venture off from our small town, my heart and mind are ready to ingest all the possibilities. Contrast my penchant for doing with my husband’s preference for just being. He has no fear-of-missing-out (FOMO). He is not petrified at the thought of losing someone’s approval. He truly just wants to vacate on vacation (imagine that?). Leave the rushed pace of the regular work-week mentality and simply… mosey. In order to play along with this mosey-mentality, I had to wrap my head around it first. Whereas I assumed it meant laziness or carelessness, the word mosey literally means “to walk or move in a leisurely manner.” That is actually something I would like more of in my life. The luxury of margin in the schedule, in the budget, in my expectations is often out of reach because I have been busy filling that white space. So for one week, instead of scraping by and grasping at last minutes and last dollars, I plan to mosey. To open up my heart and hands. To loosen my grip on expectations and fear of missing out. To be bendy. Here is my vacation agenda. More flexibility to enjoy, less expectations to fit it all in. And with every to-do list I write, I include a to-don’t list. These are the things I give myself permission to say no to. I hope you can join me for a few days of just being. PS. What are you adding or taking away from your vacation list? The Day After Thanksgiving: Is it Good Friday or Black Friday… and What Are We Really Searching For? In less than 10 days, our world will come together for the most anticipated Friday of the year: Black Friday. Long ago, I discovered some gray neutral ground for Black Friday. I do not actively avoid it, however I am not consumed by it. TBH, I appreciate the occasion for people-watching on a grand scale. The BEST part about the Friday after Thanksgiving, though, is the window of opportunity to share the some FREE, life changing truth (no catch!). On Black Friday, people stay up all night to stand in line for a deal. On Good Friday, Jesus was up all night, standing before accusers, and was dealt judgement on our behalf. On Black Friday, crowds trample each other for gadgets. On Good Friday, Jesus was trampled for the crowds to have restored relationship between God and man. On Black Friday, department stores put on-trend items on clearance. On Good Friday, Jesus put salvation and adoption into the family of God clear-of-all-charge: He made it absolutely free. On Black Friday, stores provide access to hot deals to the the first 50 shoppers in line.. On Good Friday, Jesus provided all-access redemption with the Holy God of creation to anyone who would receive it. Though the sky, indeed, turned black on the day Jesus died, we remember it as GOOD because it is the ONLY way humanity can ever be in the light. 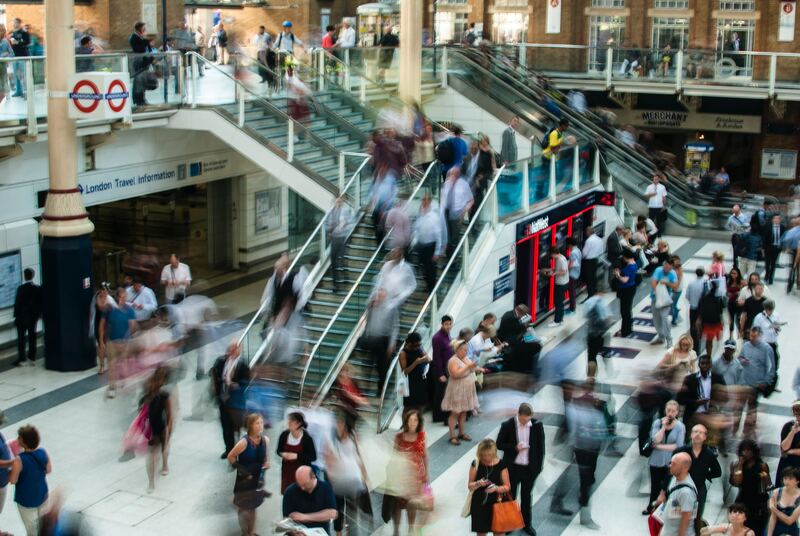 When we search for fulfillment via Black Friday, we get a momentary thrill. When we search for fulfillment via Good Friday, we find true rest, redemption, and eternal-filling with joy! I might snag the perfect gift for my special-someone, at a once-in-a-lifetime affordable price, on Black Friday this year. But I will probably feel compelled to do it all again the next year. However, because of Good Friday, I am considered special to the ultimate Someone, who reminds me to pass the true Gift on and on. For some, it truly will be a once-in-a-lifetime chance to hear about life-giving hope. Whatever your reason for waking up next Friday, I pray you continue in the spirit of gratitude and kindness of Thanksgiving throughout the week. PS. Don’t know where to start when it comes to Good News about Good Friday? Check out this post for some Gospel H.A.C.K.S. Please SHARE this post to offer hope and clarity from the Friday confusion. *This post originally appeared on November 21, 2016. It has been updated to optimize encouragement for readers of campfiregrace.com. Every year the debate continues should Christmas celebrations start before or after Thanksgiving? Here in the audacious year of 2017, the pivotal day in question has been moved to Halloween. I am definitely not a Christmas-before-Thanksgiving hater. However, I am the kind of person that worries about someone or something feeling left out. For crying out loud, I feel terrible if I do not give each of my clothes a turn to be worn in a given month. November deserves a turn, in my opinion. When I think about all the things I will miss if I were to wish away November so we could move on to Christmas season, I get sad. Already, we have enjoyed our kids’ first time ice skating. We marveled as our brown world got a fresh dusting of white flakes. We enjoyed candy and pumpkin seeds, and still have yet to bake the cupcake mix left on our front door on Halloween (thanks to whomever “boo’ed” us!). Of course, many of us feel December flies by too quickly, so we get a head start on holiday cheer. I have been there before, and I realized the remedy was not in hijacking November. Rather, we can make December sacred again with a holy hurry, and a rediscovering of wonder. Others of us find the brown, hibernating world of November to be dull and boring. If that is you, as it was once me, I encourage you to do research on the importance of boredom in our everyday lives. But how do we rescue the novelty of November? My suggestion: make a grateful garland. This lovely swag hangs in our dining room, heralding contentment into our home with loud autumn hues. The top strand is one we saved from last year. It displays our kids’ two-year-old “grateful hands” with a daily thanks or “yay God!” The bottom strand is the start of the twins now 3-year-old grateful hands. To make the hands, I traced their little hands 5 times on a piece of construction paper (one for T and one for E), then stacked 2 more pieces of fall-colored paper to cut out 15 hands per kid. There are 30 days in November, so it is perfect. The paper hands get kind of curly after being stored in a ziplock bag for a year, but they look almost more like leaves that way. I stripped some fake fall leaves from a cheap “bouquet” I found at Walmart and tied them to the garland as well. Each day, we take turns stating what we are grateful for. I write it on a hand and tape it to the garland. It just keeps getting better. Giving me a big picture narrative for our home. I pine for the day we can buy the right couch, hip frames, and fun rugs for this room. 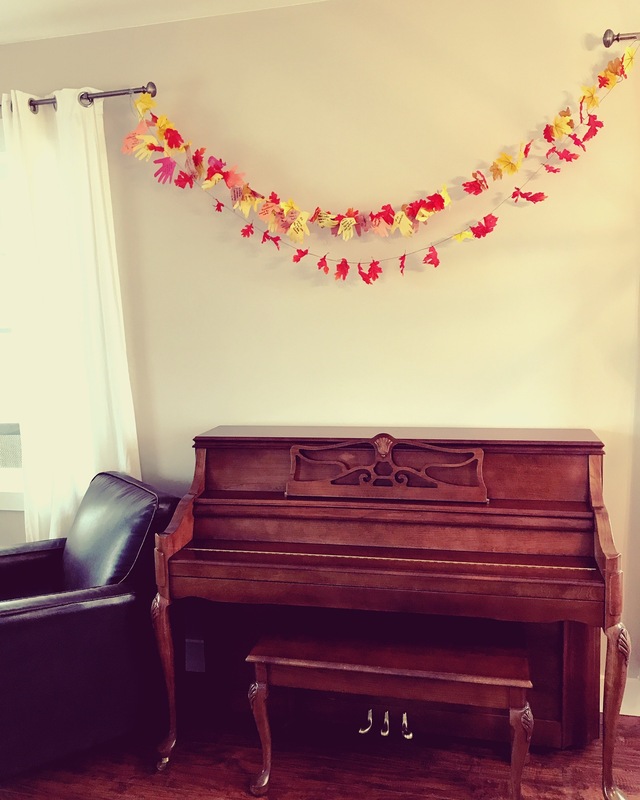 But this November, I cannot stop dreaming about the day we have 10 years of these garlands circling our dining room, climbing our stair well, and swagging over every doorframe. I love how this simple decoration activity is giving my family an awareness of our blessings. Moreso for me, though, the garland has expanded my perspective of home-making. I do a lot of online shopping, pining for the perfect couch, hip frames, and fun rugs for our new home. I get excited when I think about the day it will feel complete. But this November, I cannot stop dreaming about the day we have 10 years (!) of these garlands circling our dining room, climbing our stairwell, and hanging over every doorframe. How about you? How do you plan to rescue November from the holiday hijack? Feel free to leave a comment with your ideas! Follow me on Instagram and Facebook, and tag me in your grateful garland pics this November!